Impressive two-story 3993 s.f. 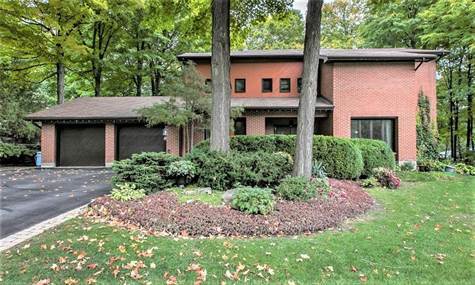 home in prestigious Rothwell Heights. Parkland setting next to Nivens Woods. Spacious sunken lvrm provides for elegant entertaining. Large formal DR perfect for family gatherings. Spectacular views from famrm w/ cathedral ceiling, large windows, & firepl. Inviting warmth in large custom kit., featuring gran. counters, island, break. bar & lots of cabnts. Main floor office w/ 2pc bath has its own exterior entrance. Bright laundry w/ door to back yard & another 2pc bath finish off main flr. MBR w/ walk in closet offers tranquility w/ stunning view. Large priv. balcony. Sitting area w/ firepl & ens bath. 4 more bdrm w/ generous closet space and 4pc bath complete 2nd flr. Attention to detail in the finished bmt. 9 & 10 ft ceilings in 42’x 32’ rec room w/ convenient kit/bar area. Relax in the spa rm w/ x-lg jet tub, walk-in shower & 2pc bath. Watch seasons change from lrg deck in landscaped yard, surrounded by magnificent mature trees.